As an introduction to the setting, Star Trek Adventures has a big job to do, because with six television series, thirteen films, hundreds of books, and numerous games to draw from, there is a lot for it to cover. Not just in terms of scope, but also in terms of time, for Star Trek’s timeline runs from the twentieth to thirtieth centuries. So at least in the core rulebook, Star Trek Adventures focuses on a particular time period and a particular set-up as a default. The setting is of course, the United Federation of Planets and its cosmic neighbours, primarily the Romulan Star Empire and the Klingon Empire. The United Federation of Planets consists of innumerable planetary members who uphold the principles of universal liberty, rights, and equality, and who co-operate in terms of sharing knowledge and resources. The United Federation of Planets’ primary service is Starfleet, an organisation which operates along military lines with a huge fleet of starships and starbases, whose primary missions are deep-space exploration, research, defence, peacekeeping, and diplomacy. The particular time period is the late twenty-fourth century, late in the period of Star Trek: The Next Generation, at the beginning of Star Trek: Deep Space 9, and before Star Trek: Voyager. The specific year is 2371. War with the Cardassian Union has ended, but the Maquis continue its campaign against the Cardassian-Federation peace treaty, keeping tensions high in the region of Bajor and Deep Space 9. In response, USS Voyager, under the command of Captain Janeway, is preparing for a mission into the Badlands where the Maquis is primarily based. Meanwhile, Commander Sisko has discovered a wormhole near Bajor which leads to the Gamma Quadrant and there identified a major new threat to the Alpha Quadrant in the form of the Dominion. This is the default set-up for Star Trek Adventures. The players take the roles of the best that Starfleet and thus United Federation of Planets, has to offer, crewing a starship or a starbase. They are members of the starship’s or starbase’s senior crew—though there is scope in the game for players to regularly roleplay members of the supporting cast—who will undertake missions for Starfleet and fulfil its directives. Mostly obviously, these are exploration missions, but other missions can be ones of scientific research, disaster relief, diplomacy, patrols, peacekeeping, rescue, and more. What is important to note here is that what the players do not roleplay are characters from any of the television series, so not Kirk or Spock, Data or Worf, Garak or Quark, the Doctor or Seven of Nine, Archer or T’Pol, or Michael Burnham or Sylvia Tilly—though many of the characters are used in the game’s rules examples. It is possible to create characters like that, but not stats or write-ups for any of the cast. Instead, what Star Trek Adventures offers in terms of characters are the Andorian, Bajoran, Betazoid, Denobulan, Human, Tellarite, Trill, and Vulcan species. These represent the default for the roleplaying game’s default time period of 2371, but guidance is given as to which species are known and serve in Starfleet in the time of both Star Trek: The Original Series and Star Trek: Enterprise. Characters are themselves defined by Attributes, Disciplines, Focuses, Values, Traits, Talents, and Values. The six Attributes—Control, Daring, Fitness, Insight, Presence, and Reason—represent ways of or approaches to doing things as well as intrinsic capabilities. They are rated between seven and twelve. The six Disciplines—Command, Conn, Engineering, Security, Science, and Medicine—are skills, knowledges, and areas of training representing the wide roles aboard a starship. They are rated between one and five. Focuses represent narrow areas of study or skill specialities, for example, Astrophysics, Xenobiology, or Warp Field Dynamics. Traits and Talents represent anything from what a character believes, is motivated by, intrinsic abilities, ways of doing things, and so on. They come from a character’s species, upbringing, training, and life experience, for example, Trill (representing their ability withstand parasites and serve as a host to Symbionts), a character having undertaken the Kolinahr, his approach to Science (Cautious), and so on. A character’s attitudes, beliefs, and convictions are represented by their Values, such as Kirk’s ‘Doesn’t believe in a No-Win Situation’, which can be triggered to provide various benefits by spending a character’s Determination points. To create a character, a player puts him through a lifepath—much like previous Star Trek roleplaying games—the seven stages of which encompass his species, home environment, upbringing, Starfleet training, career length and its events, and current status. At each stage, a player adjusts Attributes, selects and adjusts Disciplines, and picks Focuses, Traits, Talents, and Values. Some of these elements a player has to select, but he can choose to roll for them and determine randomly. Our sample character is a Starfleet brat, the son and grandson of a Starfleet Admiral who joined Starfleet to prove himself and out of tradition. He wants to be the best pilot anywhere and led Nova Squadron whilst at the academy. As fighter pilot assigned to the USS Dakota, an Akira-class vessel patrolling the Cardassian Demilitarised Zone, he became involved in the Nivoch Incident in which Cardassian vessels attacked the world in search of the Maquis. When the commander of his fighter squadron was killed as it tried to defended fleeing evacuating vessels, Kingsley took command. Only after ramming the Cardassian command vessel with his fighter shortly after beaming out, did the Cardassians withdraw. Kingsley was captured by the Cardassians and was held by them before a prisoner exchange. He has only just returned to active duty. The result is a Starfleet officer of varying though still competent experience, but Star Trek Adventures provides three other options. First, a player can play an enlisted character, one who did not attend Starfleet Academy, but was trained elsewhere. Enlisted characters cannot take Command roles. Second, a player can create a character in play, creating the basics before play and defining further elements during play. The third, is to play Supporting Characters. These represent other members of the crew and although not as detailed as full player characters—essentially members of the main cast—they enable players to roleplay other types of character, to be involved in scenes their main character would not, and to provide support where there are relatively few players in a game. Supporting characters can be fully played, but are not fully developed, having neither Talents or Values. These will come up in play as the Supporting Character reappears again and again, meaning that the players will learn more about him as the campaign goes on and he slowly grows from a Supporting Character to a Main Character. So for example, T’Peen might first appear as a member of the ship’s Emergency Medical Response Team, and her Focuses reflect that, but later on, the players might learn that she is studying Virology, has undertaken the Kolinahr, and so on… This is a nice reflection of how a Star Trek television series works, how lesser characters are elevated to a bigger role. In terms of progression, a character does not earn Experience Points as he might in other roleplaying games. Instead, to reflect the fact that the characters on screen in Star Trek grow and change only periodically, player characters in Star Trek Adventures achieve Milestones. Only Main Characters can achieve and receive Milestones, of which there are three types—Normal, Spotlight, and Arc, representing both when they occur in a series and their impact. In general, Milestones are used to change aspects of a character or the characters’ ship, rather than improve them, although they can be used to improve a Supporting Character. It takes Arc Milestones, essentially Milestones which come at the end of a story arc, for a player to make improvements to his character. A player character can also improve his Reputation, which is the main means representing his progress in Starfleet and getting promoted. Star Trek Adventures employs the 2d20 System previously used in the publisher’s Mutant Chronicles: Techno Fantasy Roleplaying Game and Robert E. Howard’s Conan: Adventures in an Age Undreamed Of. To undertake an action, a character’s player rolls two twenty-sided dice, aiming to have both roll under the total of an Attribute and a Discipline. Each roll under this total counts as a success, an average task requiring two successes. Rolls of one count as two successes and if a character has an appropriate Focus, rolls under the value of the Discipline also count as two successes. For example, Lieutenant Kingsley is piloting a shuttle when it is chased by Maquis raiders and wanting to put some space between himself and his pursuers, pushes the shuttle to thread past a pair of plasma blumes in the Badlands before they coalesce. This will be a Daring + Conn check. So Kingsley’s player will be rolling under a total of fifteen. Kingsley also has the Small Craft focus, so any roll equal to or less than his Conn will generate two successes. If Kingsley had to make a delicate landing, his player would roll Control + Conn. Rolls of twenty generate Complications for the given situation, but in the main, because a typical difficulty will only be a Target Number of one, players will find themselves rolling excess Successes which becomes Momentum. This is a resource shared between all of the players which can be spent to create an Opportunity and so add more dice to a roll—typically needed because more than two successes are required to succeed, to create an advantage in a situation or remove a complication, create a problem for the opposition, and to obtain information. It is a finite ever-decreasing resource, so the players need to roll well and keep generating it, especially if they want to save for the big scene or climatic battle in an adventure. Main characters like the player characters possess Determination, which works with their Values. A Value can either be challenged once per session in a negative or difficult situation to gain Determination or invoked once per session to spend Determination to gain an extra die for a check (a ‘Perfect Opportunity’), to get a reroll of the dice in a check (‘Moment of Inspiration’), to gain a second action when time of the essence (‘Surge of Activity’), and to create an Advantage (‘Make It So’). They also have Talents and Traits which will grant a character an advantage in certain situations. So Bold (Engineering) enables a player to reroll a single twenty-sided die for his character if he has purchased extra dice by adding to the Game Master’s Threat pool or Dauntless, which allows a player to roll an extra twenty-sided die for his character to resist being intimidated or threatened. Now where the players generate Momentum to spend on their characters, the Game Master has Threat which can be spent on similar things for the NPCs as well as to trigger their special abilities. She begins each session with a pool of Threat, but can gain more through various circumstances. These include a player purchasing extra dice to roll on a test, a player rolling a natural twenty and so adding two Threat (instead of the usual Complication), the situation itself being threatening, or NPCs rolling well and generating Momentum and so adding that to Threat pool. In return, the Gamemaster can spend it on minor inconveniences, complications, and serious complications to inflict upon the player characters, as well as triggering NPC special abilities, having NPCs seize the initiative, and bringing the environment dramatically into play. What the Momentum and Threat mechanics do is set up a pair of parallel economies with Threat being fed in part by Momentum, but Momentum in the main being used to overcome the complications and circumstances which the expenditure of Threat can bring into play. The primary use of Threat though, is to ratchet up the tension and the challenge, whereas the primary use of Momentum is to enable the player characters to overcome this challenge and in action, be larger than life. Combat uses the same mechanics, but offers more options in terms of what Momentum can be spent on. This includes doing extra damage, disarming an opponent, keeping the initiative—initiative works by alternating between between the player characters and the NPCs and keeping it allows two player characters to act before an NPC does, avoid an injury, and so on. Damage in combat is rolled on the Challenge dice, the number of star symbols and Starfleet insignia symbols rolled determining how much damage is inflicted. A similar roll is made to resist the damage, and any leftover is deducted from a character’s Stress. If a character’s Stress is reduced to zero or five or more damage is inflicted, then a character is injured. Any Starfleet insignia symbols rolled indicate an effect as well as the damage. In keeping with the tone of the various series, weapon damage can be deadly, melee or hand-to-hand, less so. Rules cover stun settings and of course, diving for cover, whilst a lovely reinforcement of the genre is that killing attacks generate Threat to add to the Game Master’s pool. The rules themselves in Star Trek Adventures do not take up a huge amount of space in the core rulebook. They are clearly written and supported with a lot of examples. The core rules themselves, the 2d20 System, are easy to pick up and play, with of course, the rules for combat—especially starship combat—adding a bit more complexity. That said, the version of the 2d20 System used in Star Trek Adventures is a streamlined one comparison to the heavier mechanics of Mutant Chronicles: Techno Fantasy Roleplaying Game and Robert E. Howard’s Conan: Adventures in an Age Undreamed Of. The rest of the core rulebook is dedicated to the setting and the background of Star Trek. Much of this is given as Starfleet Command briefings, backed up with communiques, letters, and reports from the Obsidian Order of the Cardassian Union, Vulcan High Command, the Tal Shiar of the Romulan Star Empire, the Klingon High Council, and so on. Many of these are linked to particular events depicted in both the Star Trek series and films, such as Colonel Worf’s report to the Klingon High Council following the Khitomer Accords, a letter from a certain Edith Keeler in the Desperate Decade, and a message to the Vulcan High Command about the imminent launch of the Enterprise NX-01. These take the place of a traditional timeline, providing a good overview of the Federation both from within and without. They are rich in the details that Star Trek fans will enjoy recognising, but anyone less familiar with Star Trek canon may find themselves somewhat adrift without a proper timeline which might have put the history in context. Beyond this, Star Trek Adventures presents Starfleet’s ongoing mission and explores the Final Frontier and what might be encountered there, from World Classifications and alien encounters to stellar phenomena scientific discoveries and developments. Chapters on technology, equipment, and starships covers everything that the player characters might find useful in successfully fulfilling their mission, in particular focusing on how Starfleet personnel can adapt their equipment to the situation, often in the desperate situations that they sometimes face. In terms of starships, Star Trek Adventures provides models from Star Trek: The Original Series and Star Trek:Enterprise as well as Star Trek: The Next Generation, at the beginning of Star Trek: Deep Space 9, and before Star Trek: Voyager. The vessels include the Constellation, Constitution, Defiant, Galaxy, and Intrepid Classes as well as others, various alien vessels are also given. There is some room for customisation too. Starships are treated in a fashion similar to characters, but have Systems and Departments instead of Attributes and Disciplines. Star Trek Adventures covers just about everything that a crew might do with their ship, from general operation to going toe-to-toe with a Klingon D7M Cruiser in starship combat. The latter works in a similar fashion to that of personal combat, except that as Department Heads, the player characters are in control of different aspects of the ship. Instead of injuries for taking five damage in one hit, a ship suffers breaches which can knockout a ship’s systems. Her crew or a player character can repair them, but too many breeches and ship is disabled or even destroyed. Lastly, ‘The Rescue at Xerxes IV’ is a short introductory scenario which takes the player characters on to their new posting at Narenda Station in the Shackleton Expanse. This is the opening part of Modiphius Entertainment’s Star Trek Living Campaign. This sees them come to the aid of a science outpost which has just put out a distress call. It is decent and should provide two good sessions’ worth of play. Physically, Star Trek Adventures is superbly presented. It is laid out in the style of the LCARS—Library Computer Access/Retrieval System—operating system used by Starfleet. So everything is laid out over a rich black with the text done in soft colours. This is very in keeping with the theme and period setting of Star Trek Adventures, but it is imposing, even intimidating in its look, and it is not always easy to find things on the page because of the book’s look. The other issue is that the none more black pages are easy to mark with fingerprints. Alongside the LCARS, Star Trek Adventures is illustrated, not with photographs from the films and television series, but fully painted depictions of Starfleet and its personnel in action. These are absolutely great, capturing the strange new worlds visited and duties undertaken by Starfleet in equal measure. In addition, some thought has gone into organising the book’s content thematically, so the ‘Operations’ chapter covers the basic rules and ‘Reporting for Duty’ covers character creation, for example. The book could have done with a tighter edit in places though. There can be no doubt that Star Trek Adventures feels like Star Trek, not just in its look, but also the type of characters you play and the adventures you play. Indeed, it does a very good job of explaining both, but unlike previous roleplaying games based on Star Trek, there is less granularity to character design and a greater similarity between one character and another. At least in the Star Trek Adventures: The Roleplaying Game – Core Rulebook, since the player characters are all serving in the same organisation and are expected to be able to take positions in different departments as necessary. Once Star Trek Adventures begins to cover situations like that in Deep Space 9, there may be more variety available in terms of character options. Star Trek Adventures also feels like Star Trek because it enforces aspects of the series, such as enforcing the policy against shooting to kill by having it trigger a Threat point and by using the television series structure to model character advancement. The inclusion of Supporting Characters though, nicely balances the slow progression of the Main Characters, their being able to improve more quickly as well providing more roleplaying opportunities for the players. Anyone coming to Star Trek Adventures wanting to player characters other than Starfleet officers and crewman will probably be disappointed, at least until other sourcebooks open up the game’s scope. This though is not a criticism of the core rulebook, since it models where Star Trek itself started and what the core setting is for the franchise. It is after all, what the core rulebook should do and it is a roleplaying game about the best that the Federation has to offer. 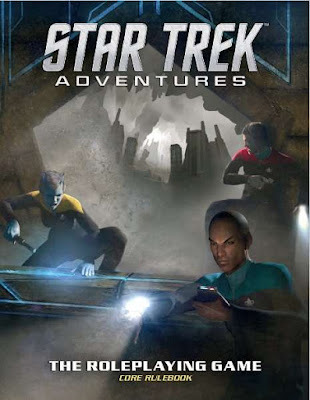 Star Trek Adventures: The Roleplaying Game presents in a highly attractive and solidly written core set of rules that are ably supported with decent background and good advice.